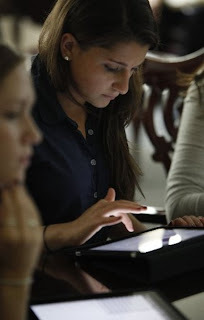 The iPad: Is it our solution for mobile learning? As we think of new ways to deliver content through mobile learning we're also thinking of ways to increase engagement with our learners. Yes, mobile learning makes learning easier because it can take place virtually anywhere. Here's an article on how a New Jersey school is using the iPad for teaching. This article utilizes the iPad in classrooms to enhance lessons and increase how the lessons are taught through robust applications. The use of the iPads in schools are different from laptops in that there are no flip screens to block the teacher's view. The battery lasts all day as well. Through the use of mobile learning devices, they've seen test scores improved by 30%. I think everyone agrees that utilizing this type of mobile learning has it's advantages, but how would we implement this in KSDL? If we were given the a few iPads to use, how can you see us "rolling" it out? Why do you think it's important for us to utilize this type of delivery? What audience/program would benefit most from using the iPad? If we were given a few iPads to use, how can you see us "rolling" it out? I think it's great that we want to explore new technology. There's a wave of interest in the device and it can highlight what we do. I also think it's a way for us to renew our appreciation for technological innovations. On the other hand, I'm always wary that it'll be like the new toy syndrome so the planner in me would like the initial exploration phase to be followed by some great implementation ideas we could rally behind. Since we are specifically concentrating on mobile learning, which is a content delivery method, I think we would need to identify where our gaps are related to content delivery with respect to our learners. Once we identify these gaps and/or future gaps we can zone in on specific groups of learners where these gaps are taking place. We will then need to come up with strategies and solutions, which the iPad could be one of them that will fill these gaps and meet the needs of these learners. We may also want to think about setting specific goals that mobile learning will achieve. In the article it was test scores by 30%, in our case it may be something a little less quantitative. But before all that we would need to be knowledgeable about the technologies, platforms, educational uses, possibilities and the mobile learning field in general. So, educating ourselves is the first step. If we were given a few, I think we would probably have our team become immersed in the various uses of iPad for learning in both hybrid and online learning environments. As Clinton mentioned, the first step is to educate ourselves followed by piloting with our own DL programs or those we support. I think it's important for us to stay connected with the most current technologies so we can determine strategies that could enhance student learning with technology as "tool" to support learning. I think all our programs would benefit from the use of the iPad as a mobile device. From what I've read so far, this technology is very reasonably priced. Therefore, it provides additional opportunities for us to reach out to learners who may not have access to computers, something we always keep in mind when we push out our DL programs.